At Cape Sebastian, the Pacific coastline juts westwards a way and the land rises 700 feet almost vertically, making this one of the highest and most far reaching ocean viewpoints in Oregon. 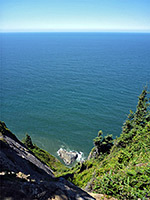 The top of the point is covered by a thick forest of Sitka spruce and other trees, and is crossed by a short trail leading to a series of overlooks, from where the vista stretches 25 miles northwards, as far as Humbug Mountain, and a similar distance south, to the coastal hills of north California. 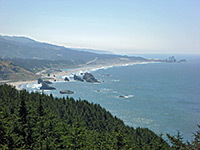 The promontory is contained within the day use Cape Sebastian State Scenic Corridor, extending several miles either side of US 101, and also including part of the inland forest, plus a sheltered, south-facing beach (Hunters Cove), which has wide, grey-brown sands and a scattering of offshore rocks. There is no charge for entry or parking, and few facilities, but the state park is quite popular owing to the spectacular, easily accessed viewpoints. 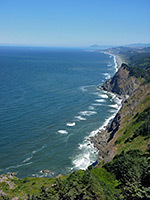 A short, steep, paved side road forks off US 101 and climbs to a parking area at the summit of Cape Sebastian, formed by a narrow ridge that continues westwards towards the ocean. A trail follows the ridge, through low, dense, wind-shaped bushes typical of such exposed locations, initially giving views to the south, towards distant rocks of Crook Point and Mack Reef, before the path runs right along the rim of a steeply sloping hillside overlooking land to the north. 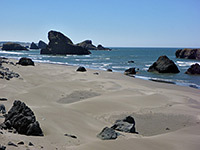 Ahead stretches a line of rugged cliffs and small beaches, followed by the more extensive sands around Gold Beach, and then Humbug Mountain on the horizon. The trail becomes more enclosed, through tunnels in the thick vegetation, which allows only occasional glimpses of the sea - now the views are due west, across the open ocean. Because of the great height, the sheerness of the cliffs and the (usually) strong winds, this is perhaps the most intimidating overlook along the south Oregon coast. 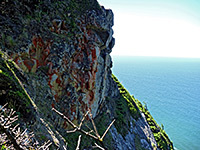 A few places have views directly down, to a band of jagged rocks lining the lower edge of the cape, 700 feet below. 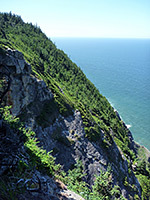 The path eventually moves away from the cliff edge, out of sight of the ocean, and starts a long descent through taller and more open woodland, arriving at the north side of Hunters Cove after 1.5 miles. 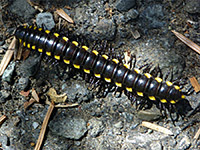 This place is also reachable along US 101, which descends to near sea level and stays there for a few miles, through the nearby Pistol River State Park. The beaches hereabouts are quite wide, formed of clean greyish sand and dotted with large, isolated rocks, some accessible at low tide, others a little way out to sea.